Review: Xiaomi Redmi 2S – Too Good To Be True? The Xiaomi Redmi 2S looks really nice! With the dual AI power camera, you must be able to shoot some really good pictures, right? Are you taking a lot of selfies? There is also an AI powered 16MP camera on front! We are always looking for the latest tech. With the Xiaomi Redmi 2S we have the AI powered camera’s, which is something we will see a lot more in the future. We of course have the Huawei P20 Pro, which has a AI powered camera. Now Xiaomi has a smartphone that has that same feature as well. Let’s have a look at the hardware! The Xiaomi Redmi 2S comes in a simple red box, like we saw with the Xiaomi Redmi 5A. The model, Redmi 2S, is on front and on the sides and on the back we find minor specifications. Inside we find nothing special. We first see the Xiaomi Redmi 2S with a sticker over the screen mentioning the features again. Underneath we have a EU charger and a micro USB cable. I hoped they used USB-C, but I think it would make the smartphone more expensive. Xiaomi put a Snapdragon 625 in there, which we see a lot in Xiaomi devices. There is a 5.99″ screen with a 18:9 aspect ratio. On the back we have the fingerprint scanner and the dual AI powered camera. It has a 12MP and a 5MP camera on the back and on the front we have a 16MP AI powered selfie camera. Some people complain about the network lines on the back (the black lines above the camera) but I like them. I think it gives the Xiaomi Redmi 2S just something extra. The screen resolution is 1440 x 720, which is not full HD. For me that is fine, but it is something to be aware of before buying the Xiaomi Redmi 2S. I still think that this screen looks good for the resolution. For me it is not a deal breaker. Unfortunally Xiaomi made the back of the Redmi 2S from plastic, which gives it a cheap feeling right away. Even though it looks like metal, it is just plastic. Also there is a Micro-USB port on there, instead of the newer USB-C. I do hear some people complain about the network lines on the back, but I like them. It give it a little extra touch and it looks cool. There are some big bezels on the top and bottom of the display, which I hoped they would minimize. Want a AI camera and a 6″ screen? Click Here To Get Yours! With the AnTuTu BenchMark, we score an amazing 77973 points! This is a very good score for a device for this price. With the PC Mark test we get a 4751 points, which is not bad at all if you ask me. Taking selfies is something of the younger generation and they do it more and more often. A good front camera is a must these days. Xiaomi knows that and they placed a 16 MP camera on there. You can take good selfies with the Xiaomi Redmi 2S, but when there is too much light (broad day light) it might not show the true value of the colors. Even with some mismatched colors, the detail in the photo is amazing for this price. You can zoom in and still see the details of my face and my beard. I’m amazed by the quality, specially seen the price of this smartphone. Xiaomi placed a dual AI camera at the back of the Xiaomi Redmi 2S. I questions myself how they did it for that price, but fine! It is on there and the quality of the photo’s is really good. There are two camera, one is 12 MP and the other is 5 MP. This might not be the highest out there, but just look at the photo’s taken.. Of course the more expensive models take even better pictures, but if you are on a budget, this is a really good option. Inside we find a 3080 mAh battery which is non-removable. This might not is the biggest battery out there, but I have to say I’m impressed with the battery performance. First I thought that this was just another smartphone that was released too soon, but Xiaomi made it work! 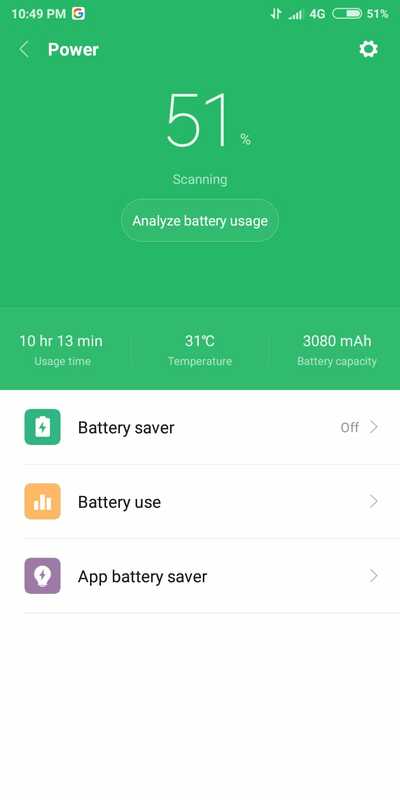 The 3080 mAh battery is capable of providing enough battery to last a day and if you are not a heavy user, you are able to use it for 2 days. 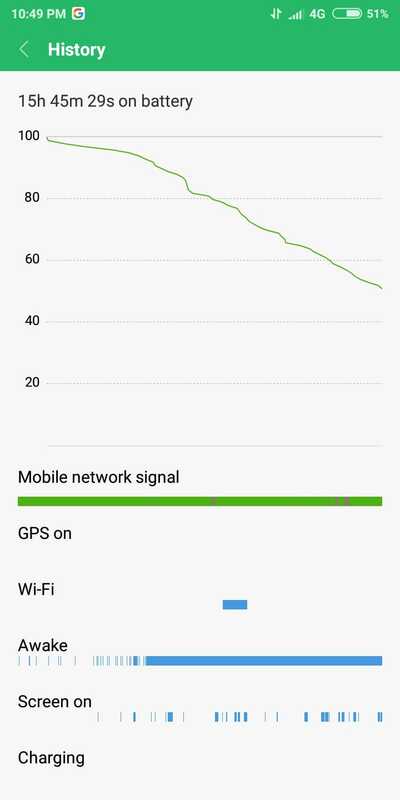 I used the Xiaomi Redmi 2S for 15 hours, as you can see in the picture below, and it is still over 50% battery! I only had this with the Lenovo P2, but the battery was way bigger in that smartphone. If you are looking for a budget smartphone that can last a day, this is the one to get! Click Here to view photo 1 larger. Click Here to view photo 2 larger. If you are into photography, like last a day on a single charge and on a budget? Stop searching! The Xiaomi Redmi 2S is the smartphone for you. Besides that, the performance is really good for it’s price and I’m really happy with the Xiaomi Redmi 2S. The AI camera takes really good pictures, the battery last over a day, the performance is good too! For it’s price this might be the best price/quality smartphone. I hoped they made the bezels are little smaller, they are pretty big now, but we can not have it all for this price. The camera looks good and makes me think of the iPhone X and the quality is more than amazing.